An interesting documentary about how bad things are with schools, that unfortunately doesn’t present everything it should. 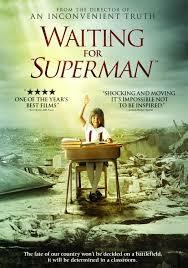 As a teacher in a new york city public school in the bronx, i liked the documentary, waiting for superman. it had a lot of interesting, hot button issues to talk about and dug into them pretty well. it also, unfortunately, had an agenda. the movie is out to prove the way the school system should be run, and does that by first showing off how bad it is. the statistics might be true, but they make things sound a lot worse than they really are. the movie starts off by showing and interviewing children who are in school. these are children of low income families, some of whom have lost their parents to drugs. the movie talks about what we, adults, are doing for these kids to give them an education. there is talk of superman and how when geoffrey canada (the main speaker in the film), was young, he asked his mother about the hero, and started crying when he learned superman wasn’t real. the idea there was that there was nobody who was coming to save him. that’s where the movie gets its title. in the first part of the movie, there are a lot of statistics and graphics and cartoon designs. they are all meant to show how bad things are in the education system of america. we are compared to other countries in jobs and in education. there are also graphics that show what percent of students graduate from high school in each state. it’s all meant to point out that there is a problem. then the movie starts digging into teachers. now this, i don’t like. apparently, based on this film, teachers are the problem. the movie would never go right out and say that, instead it tries to make the case that the system is the problem, but since teachers are backing the system, it is really the teachers. and what exactly is the problem? that there are some horrible teachers out there who are still working. one of the most interesting parts of the movie shows what one state calls their system of transporting lousy teachers, the lemon dance. each year schools in this state send their lemons, or bad teachers, to another school, and take on the lemons from another school. the hope is that teachers who were bad in one school might turn out to be okay in another school and that the principals will be able to make lemonade out of these lemons. the idea is presented to us with animation of principals dancing their lemon teachers around from one building to the next and then throwing them into the next building. it’s pretty funny. and the movie follows this storyline with showing what other states do, or call it, that is pretty much the same thing. then it gets to new york, where there used to be a system of rubber rooms. the teachers in the rubber rooms collect full salary while sitting around in a room all day, either reading the paper, doing puzzles, playing games, or sleeping. and this is what the tax payers money is going to. the reason why these teachers can’t be fired is because of the union. the movie delves into the history of unions and why they were invented in the first place. and it makes the case that unions today are wrong. it shows how these unions protect bad teachers from being fired. it also makes the case that good teachers can’t get raises above their peers. the case against the union makes sense, but what i don’t like is that this movie never interviews teachers for why they like the union. it’s a movie about teachers, out to prove what is best for teachers, and yet it never thinks to give them the chance to speak? ridiculous. i understand the logic of the argument against the teacher’s union, but there’s a reason why teachers like me support it and would rather keep it the way it is than have the possibility of getting a raise. the union means safety. it means that principals can’t target you unfairly. and as a guy, who is been unfairly targeted many times, simply because i am a guy in a system that is almost entirely women, i need that guarantee. and that’s what the movie never addresses. not the guy thing, but the reasons why teachers like unions. good teachers. instead, the movie shows the story of michelle rhee, who went down to d.c. to change the entire system and offered teachers incentives to come work for her. they could get a raise, but they could also get fired. you would think good teachers would love to do this, right? but it didn’t work out. too many people had a problem with it. and the movie never addresses why. it tells us why it didn’t work out, and it makes the case that this is what’s wrong with america, but it doesn’t ask the questions of why so many people didn’t want to do it. security means a lot, and this movie never even talks about that. there are a lot of interesting points in the film. one really fascinating statistic is that students in america rate the highest on their confidence, yet come in as one of the lowest on their actual results. when asked how they think they did on tests, more american students say they think they did well, than any other country in the world. the movie follows this stat with the green day song, american idiot, and shots of american youngsters doing moronic stunts like the kind in the jackass movies. this is funny and sad at the same time, and the stat about our country is certainly interesting. much of waiting for superman is meant to depress and anger us, and make us aware of how much the system is broken. but it isn’t as bad as the movie makes it seem. i work in elementary and just about every teacher in my school cares. it’s a school in a poor part of the bronx, which is supposedly one of the worst areas, and things at the school are pretty nice. now, i know it’s not middle school, or high school, but most of the students talked about in this film are of elementary school age. the movie is interesting, but it has an agenda and it doesn’t present both sides at all. that becomes a problem as the film goes on.